You will also need steamed rice, about 1/3 cup dry rice per person. Let’s start with the pickles, or fukujinzuke. You’ll need to do this at least the night ahead, but it’s very simple! 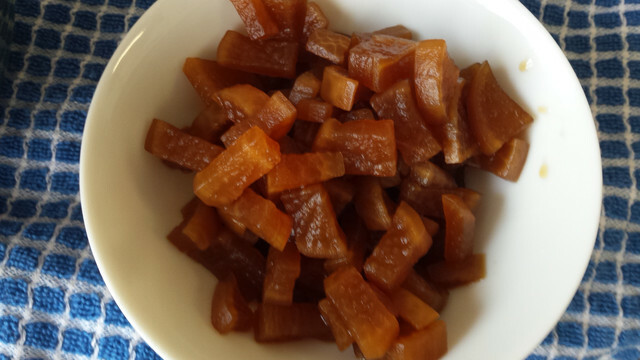 Peel and chop daikon into small pieces. 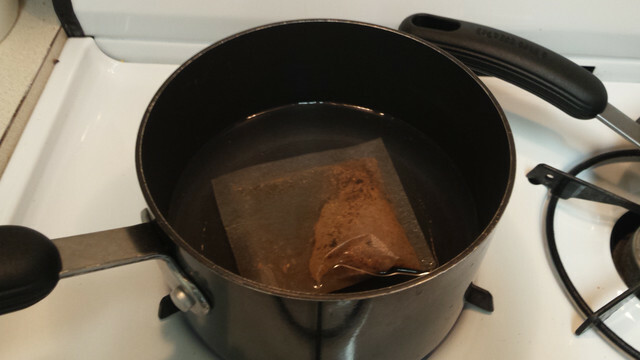 Allow to soak in a saltwater bath for 30 minutes, and then drain. Combine liquids in a pot, and sample the flavor. Make adjustments now according to your preferences- adding more vinegar or sugar depending on your tastes. Bring to a boil. Add the daikon in, and boil about 5 minutes. 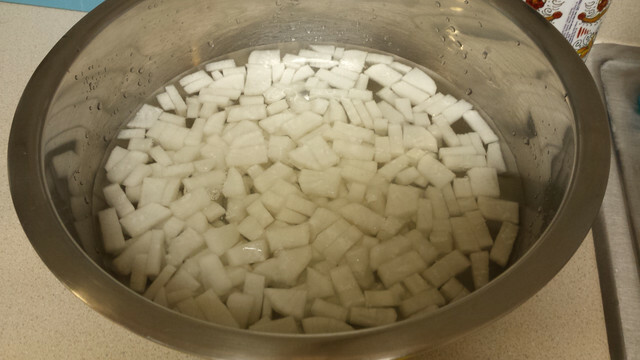 Then take daikon out, and continue to boil liquid until it reduces by half. Put daikon into tupperware container, and pour the liquids over the daikon and set in the fridge. This will keep for a few weeks, and is best eaten with rice and other meats. This type of Japanese pickle is normally eaten with katsudon/curry rice. 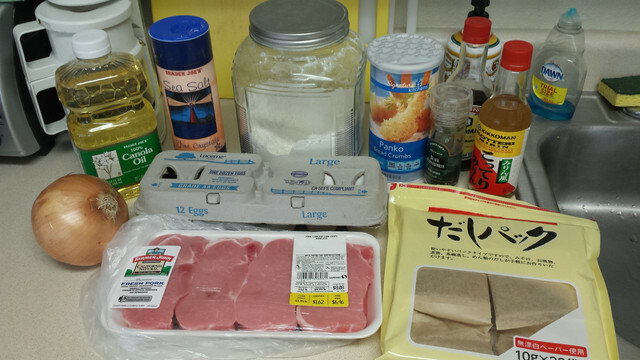 Once that’s been sitting overnight, at least, we can work on the katsudon. Start by making the sauce. 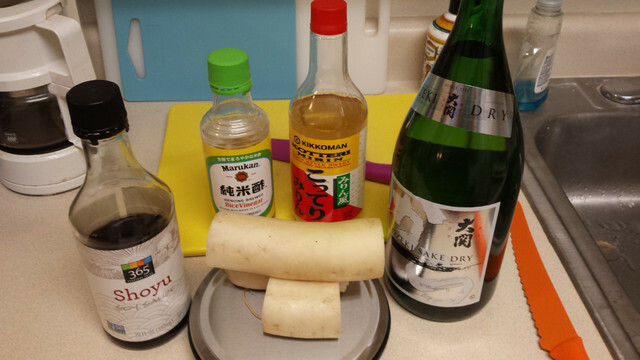 Make your dashi (I made mine according to package instructions), and combine with other liquids. Taste test as you go- this measurement of soy sauce to sugar to sake to mirin was perfect for me, but be your own judge. Set aside. 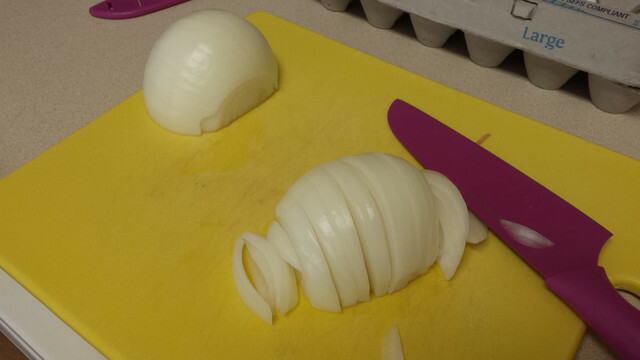 Cut your onions- first half, then slice thinly. Set aside. 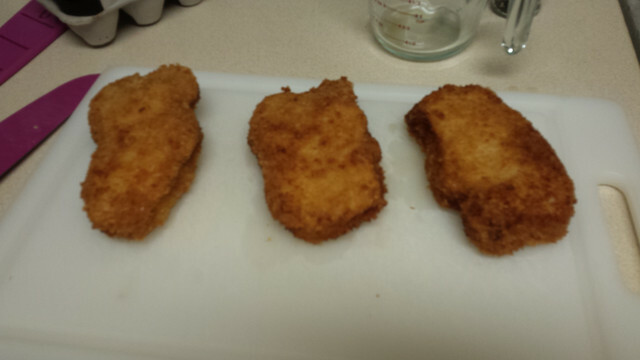 Start by breading pork cutlets. Dry pork chops, and cut in half if they’re too thick. They should be about 1/2 inch thick- mine were about 1 inch, which is quite large. Salt vigorously. Prepare breading station. 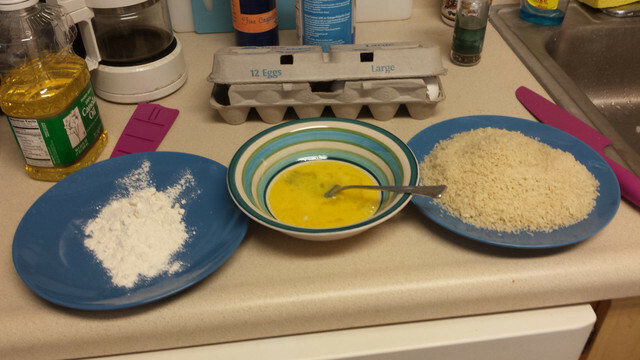 Set up a plate with flour, a bowl with scrambled, raw egg, and another plate with panko crumbs. 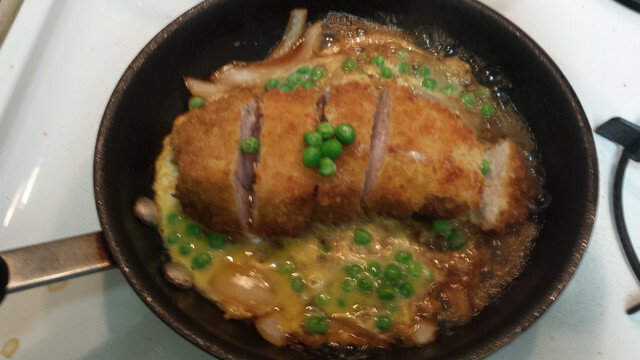 Coat cutlet completely in flour, then egg, and then panko. Set aside. Heat up a pan of oil. It’s ready when you place a wooden spoon handle in the oil and bubbles form around the end of the handle. If it’s bubbling really, really vigorously, turn the heat down just a little bit and allow to cool off. 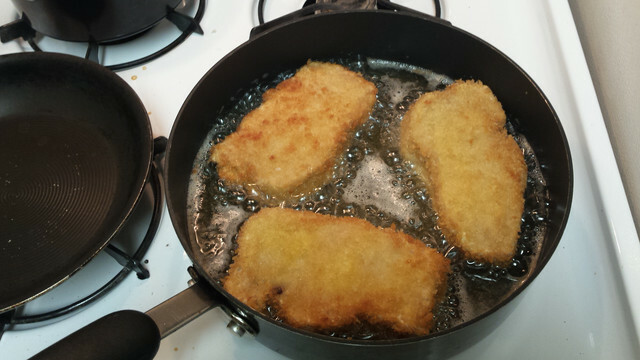 Then, place cutlets in the oil, and cook, and 4 minutes per side, or until all sides are golden brown. 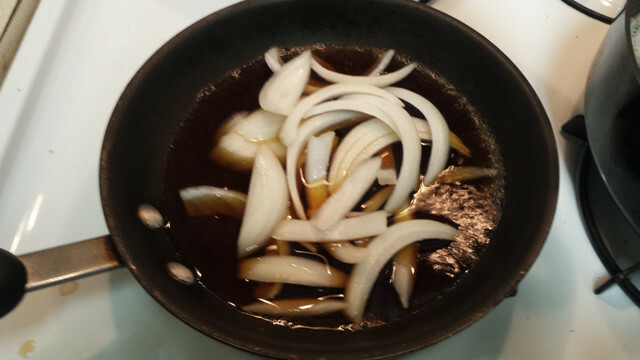 In another, smaller pan, put about 1/3 cup dashi mixture in a pan with 1/4 of the sliced onions. 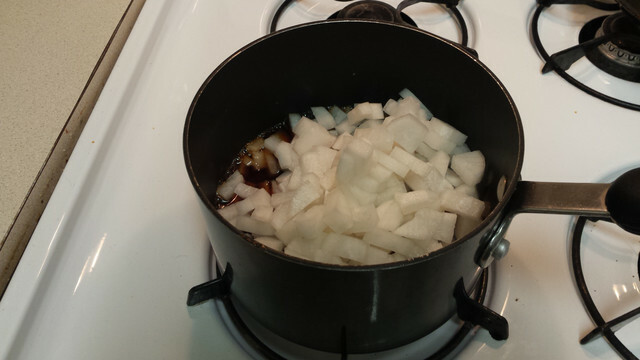 Simmer about 1-2 minutes until onions are soft. 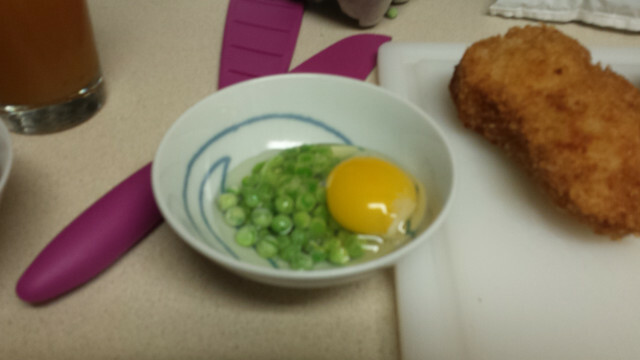 While cooking, beat two eggs in a bowl, and shake in some frozen peas. Slice one of the katsu. 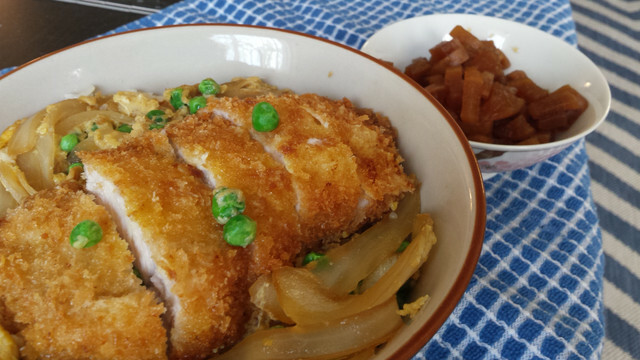 Place the katsu on top of the onions, and pour the egg mixture over the top. 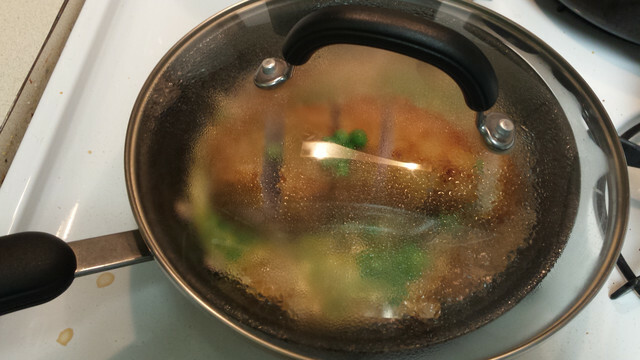 Place a lid on top and cook for about 1-2 minutes, or until egg and peas are cooked. 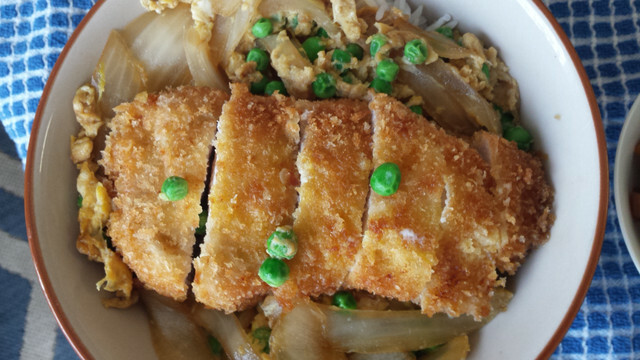 Quickly dish up a bowl of rice, and pour the onions, egg, and pork over top. Dish up your pickles on the side, and now it’s done! I fed this to my friends, and we ate it together. They loved it! I loved it! My roommate gave it her seal of approval! This dish is so filling and GOOD. Holy cow, I scarfed this bowl down and was so full, but it was so worth it! Eating the pork with the pickles at the same time was a nice treat as well- the tartness contrasted with the sweetness of the broth nicely. All in all, I’d call this an award-winning pork bowl.